THE Football Association of Ireland (FAI) today unveiled beer brand Carling as the sponsor of the inaugural Carling Nations Cup which will see the Republic of Ireland take on Northern Ireland, Scotland and Wales at the new state of the art Aviva Stadium early next year. The Carling Nations Cup, which kicks off on Tuesday February 8 2011, will be the first senior international tournament hosted in Ireland and marks a significant investment by Carling. The new tournament will be played in a league format with six matches between the four neighbouring teams, the first two taking place at the Aviva Stadium on February 8 and 9 and the remaining four taking place week commencing Monday May 23. Carling has been a major sponsor of football for many years, and today˘ announcement builds upon its range of other sponsorships which include the Carling Cup in England and Wales, the Carling Premiership in Northern Ireland and most recently its sponsorship of the Scottish national team and Scottish Cup. Niall Phelan, Molson Coors Country Manager for Ireland, said:' ”At Carling, we are as passionate about the beautiful game as the fans are and we˘€žËre thrilled to sponsor the inaugural Carling Nations Cup.' 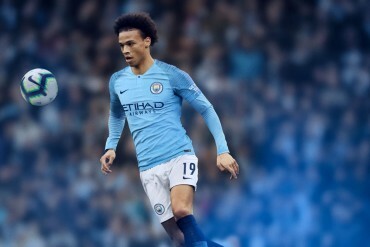 We believe that football is a great sociable experience, best shared with friends whether watching the action live at the game, in the pub or at home on the sofa.' We˘€žËre sure that the Carling Nations Cup will provide fans with plenty of entertainment and excitement. ”We will also be using this association to support the drinks industry in Ireland by investing significantly in an exciting range of marketing and promotional activities to increase footfall in pubs throughout the country,” he added. FAI Chief Executive John Delaney added: ”We are delighted to have secured Carling as the title sponsor for the Carling Nations Cup.' We will be working closely with Carling to make it an exciting festival of football for fans, tapping into the many friendships and local rivalries that exist between the four participating countries. ”The Carling Nations Cup will be a significant boost for local tourism and businesses in the Dublin area and we look forward to welcoming thousands of fans from Scotland, Northern Ireland and Wales to our new Aviva Stadium in February and May 2011,” Delaney concluded. Former Ireland goalkeeper Packie Bonner, who earned 80 caps and is famously remembered for his penalty save against Romania at the 1990 World Cup, was on hand to lend his support, alongside former internationals Pat Jennings of Northern Ireland, Craig Burley of Scotland and Ian Walsh of Wales. 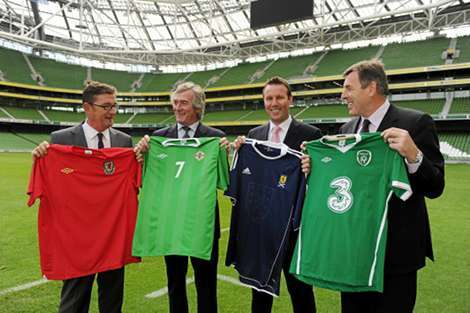 Speaking at the launch, Packie Bonner said:' ”The Carling Nations Cup is going to be a fantastic new tournament for fans of Republic of Ireland, Northern Ireland, Scotland and Wales, and also gives our international teams a chance to compete against each other in a wonderful new stadium. ”There is always a special atmosphere when international teams from Ireland and Britain play against each other and now we don˘€žËt have to rely on being drawn together in World Cup or European Championship qualifying groups.' It˘ all very exciting,” he added. ”It˘ great to see a brand like Carling, which is a huge supporter of football, lend its support to this tournament.' To use a goalkeeping term, the tournament is in safe hands,” concluded Packie. What do you think to the idea of the Carling Nations Cup? We’re looking forward to seeing the more local nations (who sometimes don’t always get to shine at major tournaments) play some top football at a great new stadium. Our only concern? The weather in Dublin in February!! Nice idea, shame England aren’t involved like the old days.